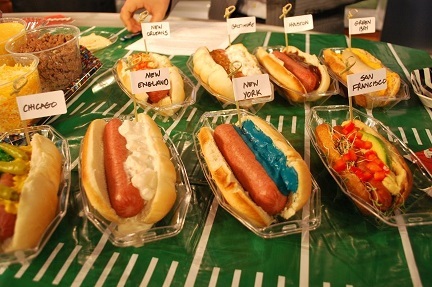 The Hot Dog Recipes on this page celebrate an all-American tradition - with a twist - or two. From Memorial Day to Labor Day, Americans eat millions of them. Okay, it's Hot Dog Season! Hot dogs are still an American favorite, especially during barbecue season. Some people I know say they can't enjoy watching a baseball game without a hot dog! And, of course, we cook them at family cookouts and sports watching events. ...but the restaurant and I like to serve them in a variety of ways, both at home and at the restaurant. One time we might feature New York Style Hot Dogs; another time we have Chicago Style hot dogs, sometimes chili dogs sell well and so on. I have experimented with a number of hot dog recipes over the years and have found several that are very much appreciated by the restaurant guests and my family. But there are two important points to understand about serving hot dogs: the quality of the product and what condiments are served with them. In New York City and the area immediately surrounding - it will be served with steamed onions with a pale yellow mustard. Coney Island hot dogs are usually topped with a spicy meat mixture. In some parts of Maryland you might find your hot dog split and deep-fried. 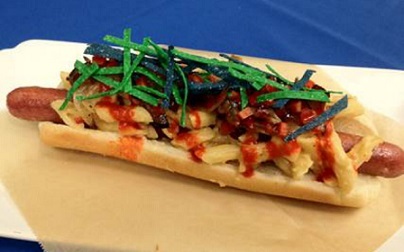 In Atlanta and many parts of the South you might be served a dog topped with cole slaw. Kansas City has a hot dog recipe that usually calls for sauerkraut and melted Swiss cheese on a sesame seed bun. In many parts of Texas you can expect the hot dog to be topped with chili, cheese (often Monterrey Jack) and jalapenos or salsa. How about quality? What are hot dogs made of? 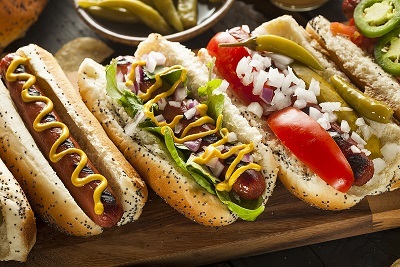 Traditional hot dogs are made of beef, pork, veal, chicken or turkey. They are made with or without skins and may contain up to 30 percent fat and 10 percent added water. For vegetarians, there are tofu hot dogs. Beef or all-beef hot dogs contain only beef. No soybean protein or dry milk solid fillers are added. Kosher hot dogs are also all-beef and often are seasoned with garlic. 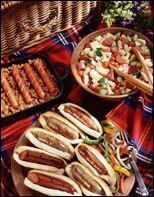 Meat hot dogs are usually a mix of 40 percent pork and 60 percent beef with no fillers. Frankfurters may contain up to 3.5 percent fillers and made from a combination of meats. Are hot dogs bad for your health? Maybe. Almost all varieties of hot dogs contain sodium nitrite which some researchers say are carcinogens. Others deny it. Sodium nitrite is a chemical salt used as a preservative and flavor enhancer in hot dogs, wieners, and sausages. It is particularly effective against botulism strains. Some people have reported other health problems from indigestion to sudden drops in blood pressure. And don't automatically think that chicken or turkey hot dogs are lower in fat because it is not always so. I buy only all-beef hot dogs or Kosher hot dogs for use at home and for the restaurant guests in the lounge. I have tried serving turkey or chicken hot dogs but my guests don't want them. Whether you call them hot dogs, red hots, wieners, franks or frankfurters, learn the good, the bad and the ugly, and try some hot dog recipes. Note: Sport peppers (Capsicum annuum) are small hot peppers that resemble Tabasco peppers, but the Sport pepper is larger, about 1-1/2 inches long and 1/2 inch wide. They are medium-hot. This is the popular pepper that is pickled and used on hot dogs (Chicago-style dogs) and sandwiches. Cook hot dogs on the grill to 170° F.
Place each hot dog in a toasted or oven-warmed poppy seed bun. Serve these Chicago-style hot dogs with thin-sliced fried potatoes. Preparation time: 10 minutes. Serves 2. Preparation time: 10 minutes. Makes 4 single chili dogs. I sometimes like to add shredded cheddar cheese on the top. I also like to toast the buns on a grill or in the oven. Oh…wait! I have just added a new hot dog in the lounge! A Russell Wilson Hot Dog! All beef dog topped with macaroni and cheese! It is a best selling hot dog! 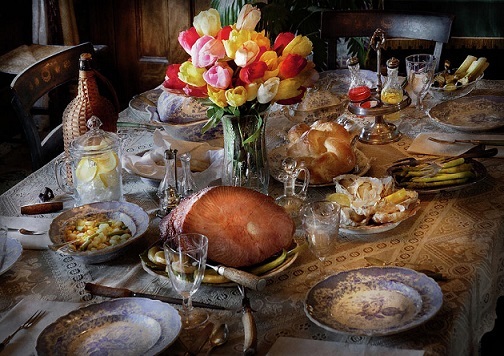 Please don't forget to visit Holiday and Special Day Menus where you'll find suggested recipes for those special occasions and for home cookouts. Enjoy your hot dog recipes and the company of them you share them with! Did you know? President Franklin D. Roosevelt served Hot Dogs to King George VI and Queen Elizabeth of England during their 1939 visit to the United States. It was the first time they had tried this American gourmet treat.